Each collaboration uniquely satisfies the specific needs of its participants and is built on models that include bank acquisition, investment, or partnership with a FinTech. It wasn’t that long ago that traditional banks viewed FinTech firms, or Fintechs, as competitors. Those days are way behind us. Nowadays, incumbents and FinTechs have become best friends, or at least collaborators, to leverage each other’s complementary strengths and focus on shared goals. FinTechs are constantly disruptively unbundling many traditional banking services by simplifying and improving customer experience (CX), and customers aren’t shy about showing their appreciation. From the start, FinTechs have focused on resolving financial services’ inefficiencies and high-friction approach to customer service. Bolstered by operational advantages including a lower cost base, no burden of legacy systems, emerging technology adeptness and a culture of taking risk to best serve the end customer, FinTechs hit the ground running to provide an engaging, contemporary CX. Traditional financial institutions have a vast customer base and deep pockets. Due to legacy systems, their solution to innovation is to adopt an API culture. As such, they are now very open to collaboration with smaller players rather than building the new blocks. 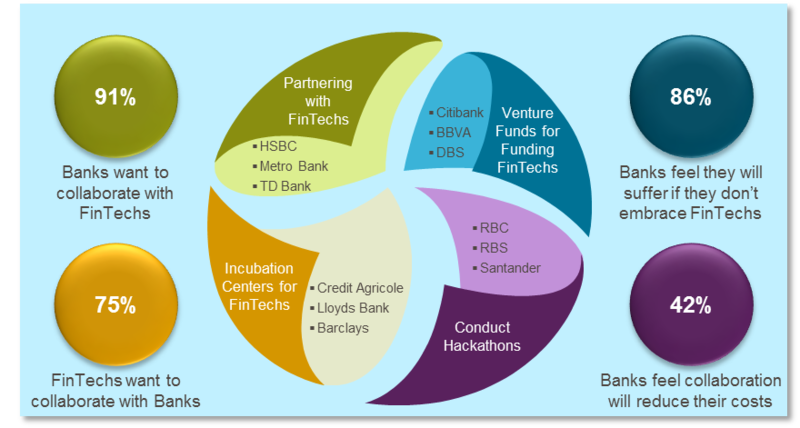 They are now forging long-term relationships and commit necessary resources to a FinTech collaboration. Traditional financial institutions have been actively trying to adopt the FinTech approach to customer experience, either by buying startups or by partnering with them. Though, the scalable and industrialized results have been limited, mainly due to finding the right partner or right approach to jointly fuel growth. Retail banks have felt the impact from this disruption and heightened competition, with stricter regulations and sporadic economic growth adding to their challenges. However, customers don’t seem to be looking back as they embrace digital platforms, particularly early-adopter millennials who came of age with digital financial products and services. So, it’s no surprise that traditional banks are looking to develop new revenue streams, reduce costs, and meet rising customer expectations. Even though many incumbent banks are now strategically focused on innovation and agility, they are plagued by archaic legacy systems, and in-house digital innovation efforts have not been very successful. Therefore, more and more traditional banks are collaborating with FinTechs, with 91% of bank executives saying they would like to work with FinTechs, and 86% voicing concerns that a lack of collaboration could hurt business within the fast-evolving digital ecosystem. Moreover, 42% of bank executives said FinTech collaboration would help them lower their cost base. Regulations that involve customer data sharing – such as Europe’s Revised Payment Service Directive (PSD2) and Open Banking Standards in the UK – are also encouraging bank/FinTech partnerships. Each collaboration uniquely satisfies the specific needs of its participants and is built on models that include bank acquisition, investment, or partnership with a FinTech. Engagement approaches – to suit business models and combined goals, can take the form of incubators/accelerators, hackathons, or use of application programming interfaces (APIs) to open systems to third parties. Already in 2013, Citibank launched an annual four-month accelerator program and currently offers “Citi Mobile Challenge,” a “virtual” accelerator program that combines a virtual hackathon with an incubator. Mentored participants learn through virtual and on-site boot camp curriculum. Frankfurt, Germany-based “Main Incubator” was launched in partnership with Commerzbank in 2013. It supports FinTechs through dedicated VC funding, office space, and expert know-how. DCB in India is promoting financial technology through its Innovation Carnival Hackathon, in which FinTechs develop financial products and create new technologies for DCB Bank. FinTech experts and entrepreneurs mentor the participants. Santander, headquartered in Spain, and peer-to-peer lending marketplace, Funding Circle, have teamed up in the UK, wherein Santander refers small business customers seeking a loan to Funding Circle. It appears that collaboration is the way of the future for the financial services industry, as new technologies and standardization create a better, more integrated landscape leading to a better customer experience. Partnership that encompasses mutual business goals and leverages both entities’ strengths will ultimately provide differentiated products and services, and leverage technology for more profound consumer insights. The industry will likely converge towards open banking and an API-based ecosystem that enables a connected network of banks and FinTechs. Although collaboration can be fraught with challenges (cultural differences, IT incompatibility or sluggish agile implementation), a commitment to mutual understanding and an enhanced customer experience will foster success. Find out more in Top-10 Trends in Retail Banking 2018, a report from Capgemini Financial Services. Millennials are generally considered to be individuals born between 1982 and 2004. “InsurTech” or the way to innovate and disrupt the Insurance Industry?